This interview is also available in Farsi (pdf). Welcome to a Conversation with History. I'm Harry Kreisler of the Institute of International Studies. 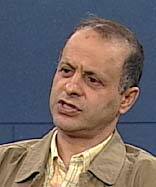 Our guest today is Akbar Ganji who is Iran's most prominent political dissident. He is a man of ideas and a man of action, a writer and a journalist. 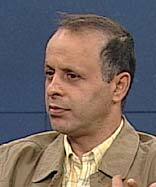 His articles have been collected in books such as The Dungeon of Ghosts and The Red Eminence, The Grey Eminences, which expose the leadership of Iran's involvement in a series of killings of writers and dissidents. His subsequent imprisonment for this courageous exercise of freedom of the press led to torture. From his jail cell he has written A Republican Manifesto, laying out the basis for a full-fledged democracy in Iran. His extraordinary, courageous efforts won him international recognition, and he is a winner of the 2006 World Association of Newspapers prestigious Golden Pen of Freedom Award. 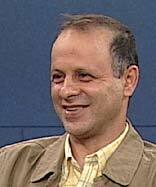 We are joined in the studio by Arash Aramesh of UC Berkeley, who will interpret.